Gareth Southgate is a "really strong" candidate to become the next permanent England boss, says Football Association chief executive Martin Glenn. But Glenn says a final decision on the appointment will not be rushed. Southgate, 46, ended his four-match interim reign unbeaten with a 2-2 draw against Spain on Tuesday. "Clearly, his candidacy has become much stronger," said Glenn. "We just need to weigh up the facts and take time to make the right decision." Southgate suggested after the Spain draw that he is keen on the position full-time, saying that he believes he has shown he can cope with the intensity of leading England in high-pressure matches. Southgate stepped up from his role as England Under-21s manager in September when Sam Allardyce left after just one game and 67 days in charge. The former England defender oversaw a comfortable World Cup qualifying win against minnows Malta, before his team laboured to a goalless draw in Slovenia. He took a significant step towards being appointed full-time manager with a 3-0 win against old rivals Scotland last week, before his team squandered a 2-0 lead in the friendly against Spain at Wembley. Prior to becoming part of the international set-up, Southgate's only managerial experience was a three-year spell at Middlesbrough, who were relegated under him in 2009. However, Glenn has been impressed with how Southgate has developed since he has been involved with the England international sides. "His candidacy is not just based on one or two matches, but because of what we've seen over the last couple of years," he added. "He's got renewed confidence and is a different manager to what he was two years ago. So it is not all about assessing him on a few games, you have got to see it more in the round." Who will choose next boss? Glenn, along with FA chairman Greg Clarke and technical director Dan Ashworth, form the selection panel that will decide the next appointment. 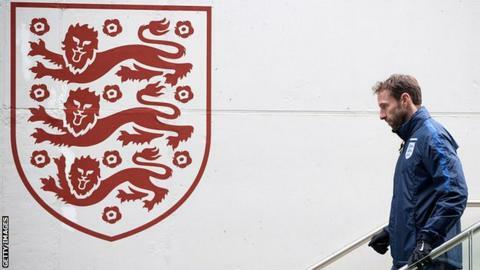 League Managers' Association chairman Howard Wilkinson and former Three Lions defender Graeme Le Saux will be asked for their views as part of the consultation processes. "There is quite a long gap between now and the next England game in March, so we've got time," added Glenn. "We will ask Gareth to review in detail the last four games and give him a bit of time to do that because that is part of the process."